A: Our analysis selects 47 major cities in Southeast Asia and examine how they are connected by road, rail, and air transport. In an intercity network, cities are treated as nodes in a network, while inter-city transportation connections are deemed ‘edges’. Individual cities’ connections are evaluated by three centrality indicators, each of which measures one dimension of ‘network centrality’: The degree centrality reflects how many direct connections individual cities have; the closeness centrality measures the overall difficulty for a city to connect with all other cities in the network, and betweenness centrality assesses whether individual cities hold a strategic position and serve as ‘bridges’ among other cities. A: Economic inequality has been rising in Southeast Asia in the past few decades. Spatial inequality in transport access is both the driver and outcome of rising economic inequality in Southeast Asia. Our analysis therefore examines how individual cities in Southeast Asia are served by different modes of transportation. A: Unlike many regional disparity studies that focus on national economic indicators, this paper takes an urban network approach to assess the spatial inequality in Southeast Asian intercity transport network. 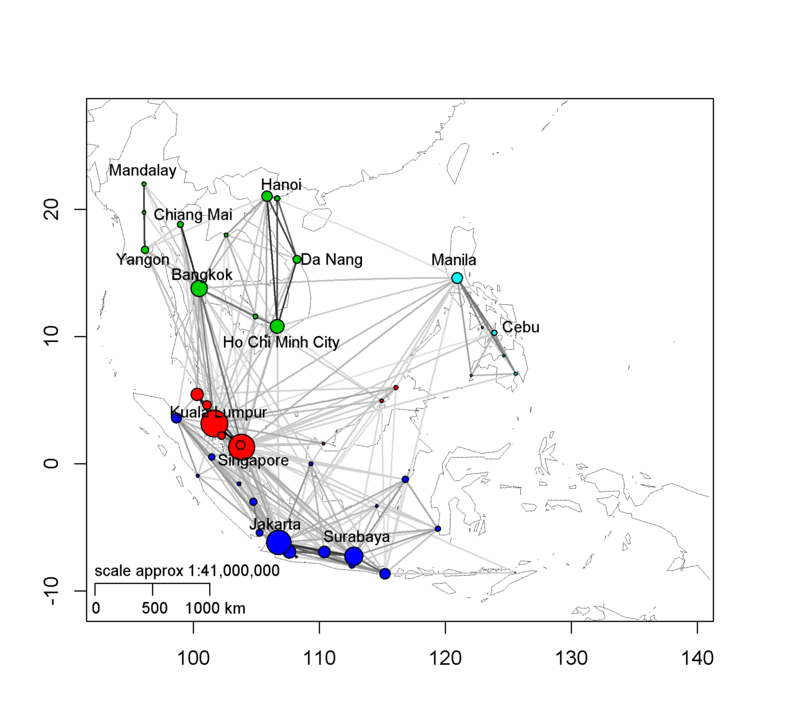 Rather than treating Southeast Asia as comprised of national political units, this paper conceptualizes the geographical space of Southeast Asia as a network of cities. A: Singapore, Kuala Lumpur, and Jakarta were identified as the most dominant nodes in terms of all three centralities in Southeast Asia transportation network. The spatial inequality is conditioned on the uneven development that dates back to the colonial times, the region’s fragmented and tropical geography, and more recent socioeconomic and political strategies. A: Seeing Southeast Asia through the lens of city networks is consistent with the new network paradigm in the “urban system” literature. The network paradigm departs from the conventional approaches of studying urban hierarchies in that the focus is no longer on the “characteristics” or “attributes” of cities in and by themselves (for examples, population size and number of companies). Using data on intercity connections has become an increasingly popular way to examine urban systems. A: Seeing space as ‘networks of cities’, what happens “between” cities might be as important as what happens “within” cities in determining cities’ fortune.